Super-Cheater K04 | Page 2 | Mazdaspeeds.org, The New Era in Mazdaspeed, CX-7 & Ecoboost Forums! Discussion in 'Mazdaspeed 3/6 Engine' started by ConeKiller, Nov 30, 2016. Can you upload the map? You changed the "Max load limit" tables to a higher value than you log, right? edit: Also I suspect there is a problem with the chart function in VT because when I manually graph this log in excel, I don't get that really crazy looking choppiness in IDC that you do. I'll upload the map this weekend. Yup, I believe I have all of the load tables adjusted up. It'll hit and maintain high 2.2/2.3 loads, but fueling is the issue. Good news on the graphing if the IDC's. FYI- Currently the car is on E-40 as an element of troubleshooting, but I'm planning on moving down to e15/e20 for the additional fueling headroom. still seeing fueling not meeting targets, not sure why. I redid the map in a different OTS tune in versatune with 93 for the larges amount of fueling overheard possible. Not sure whats up- logs show WOT Fuel trimming still, and some random desired AFR's of 1.0/0.99 (car seems to ignore this). 3 logs attached, with tune (zipped due to file extension issues). Thanks. I have played around with these tables a bit before in an effort to turn off the WOT/open loop trims, based on @Enki's thread , and they work in that regard. I'll cross-check, but I'm pretty sure these tables are already set to 3.0 load. I've ordered an ethanol mixture testing kit to get an definitive read on specific gravity, and I'll drop the closed loop load limits to see how accurate my MAFCAL actually is, and if adjusting it has any effect on the weird open loop fuel trims. FWIW- when I was initially troubleshooting this issue, I tried greatly increasing the MAFCAL past 3.5v (htp4") to force the car to richen the mixture- with no effect. It seems that the open loop trims have greater authority than I expected. 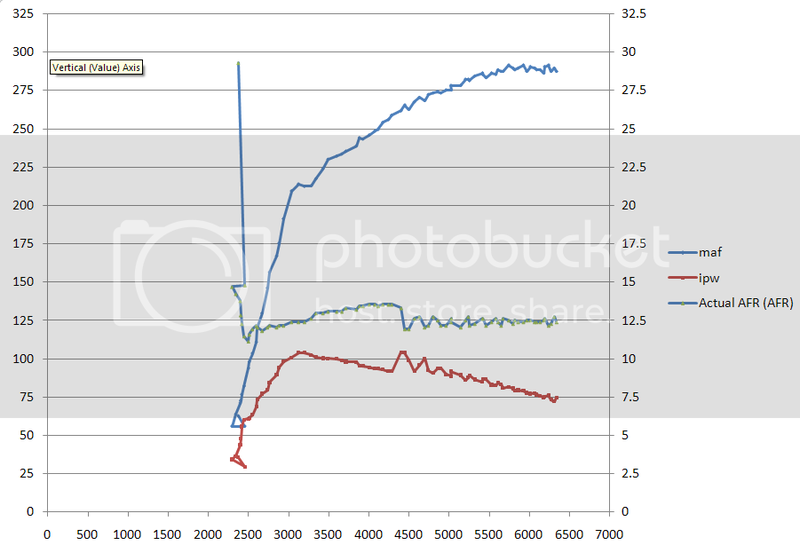 They have a 20-25% limit, just like LTFT and STFT, if memory serves. 2) You should set the "Open Loop WOT AFR Target Knock Present Extended" table the same as the other two WOT tables IMO. The ECU will enrichen the mixture on its own when knock is detected. No need to dump more fuel on top of that. This will prevent a lot of AFR wobbliness. 3) You aren't missing targets by much. I think a MAF cal adjustment will get the job done. I do mine the lazy way...divide logged lambda by target lambda and multiply the corresponding MAF voltage cells by the resulting multiplier. I really don't see anything obviously wrong with the tune. Of course I'm also back to using Cobb again so finding the tables I'm interested in in VT is difficult and I probably forgot to check a few as a result. #3 - in the works. I gotta spreadsheet for that! Subbing, because I'm trying to keep everything as stock (looking) as possible. 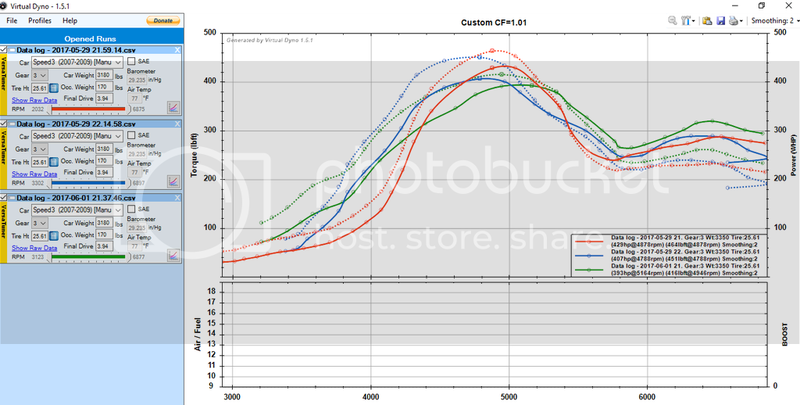 For the sake of the rods and ringlands, the wgdc is going way down now that I've hit my self-imposed target power figure. That massive drop in power after the peak is due to the lean condition. the proposed treatment is time- at this current moment I don't have a hardware or tuning fix for this, but most have reported that this goes away with time. I have a feeling this car died and went to speed6 heaven.